The world’s population is growing and space is finite. It’s inevitable. Every day, more and more people compete to live in the limited number of safe, happy, desirable places on this planet and that invariably means, to accommodate all of those people, places not only go up in price, but get smaller. If you live in a major city, and increasingly in smaller cities across North America, you may be trying to figure out how to get by with limited or even non-existent storage space. Here are 5 storage ideas that can help you make the most of a little space. Don’t let your walls go to waste. Bikes, umbrellas, even shoes can all be suspended from the wall. Floor space, in any space, let alone a micro one, is prime real estate. Free up the floor for things like furniture, or mats and rugs that open areas up. Baskets add space. A collection of matching baskets can look incredibly stylish and help economize on space in areas like under the sink, bed, or in place of shelves under night tables or even kitchen and coffee tables. Repurpose hanging shoe holders. Behind the door shoe holders are handy contraptions but they don’t just have to hold shoes. You can free up a fair bit of space in armoires and drawers by stashing small clothing items like socks and underwear in hanging storage devices behind your door. It may seem like a sacrifice in style, but compromises must be made if you want to live free of clutter. Invest in a shower caddy. Showers can quickly become clutter points. Shampoo, conditioners, oils and soaps, left to their own devices, will quickly colonize the entire surface area of your shower, or even bathroom. Having something to organize all of these toiletries is guaranteed to make your shower/bath tub feel much larger by keeping everything off the floor and out of the way. Peg boards in the kitchen. Peg boards in the kitchen are essential. Most small homes and apartment have impossibly small kitchens, sometimes barely enough space to turn in a full circle. To efficiently store pots and pans, leave drawer space for smaller items, and install a couple of peg boards on the wall above the stove and oven where you can easily hang cookware. Making the most of a small space takes some strategic thinking and a little bit of ingenuity. It’s not easy to find space where none seems to exist. 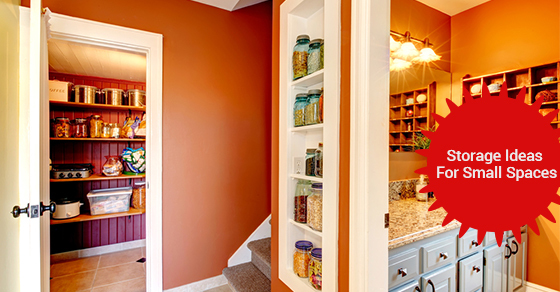 However, if you implement some or all of the small space storage ideas mentioned above, you will start to notice just how big of an impact these small adjustments can really have on your home.